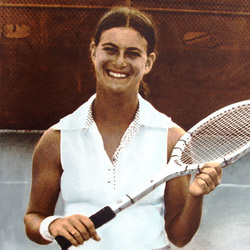 Jodi Appelbaum-Steinbauer was a four-time All-American in women's tennis from 1975 to 1978 and is one of only three UM tennis players, male or female, to garner All-America honors in all four years of her collegiate career. In her junior year of 1977, she teamed with Terry Salganik to win the USTA doubles title and was a semi-finalist in the singles competition. In 1978, Appelbaum reached the USTA doubles finals for the second consecutive year, this time with Kim Sands, and the pair finished as runner-ups. Jodi was a member of the Junior Federation team of female college players that toured the country in the Summer of 1978. During her four years at UM, the tennis team went 69-7 and were the 1976 state champions. Jodi was inducted into the UM Sports Hall of Fame in 1993 and served as the HOF's president from 2007 to 2009.